For Your Eyes Only (1981) is the twelfth spy film in the James Bond series, and the fifth to star Roger Moore as the fictional MI6 agent James Bond. The screenplay takes its characters from and combines the plots of two short stories from Ian Fleming's collection For Your Eyes Only: the title story and Risico. It also includes elements inspired by the novels Live and Let Die (the keelhauling sequence), Goldfinger (the identigraph sequence) and On Her Majesty's Secret Service (the opening at the graveyard). In the film, Bond and Melina Havelock become tangled in a web of deception spun by rival Greek businessmen against the backdrop of Cold War spy games. Bond is after a missile command system known as the ATAC (a MacGuffin introduced to tie together the original stories' plots), whilst Melina is out to avenge the murder of her parents. 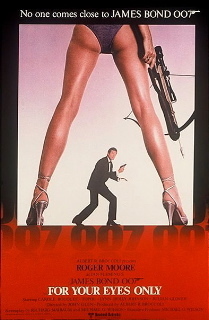 As well as seeing a conscious return to the style of the early Bond films and the works of 007 creator Fleming, and therefore a more gritty, realistic approach (following the science-fiction Bond film Moonraker), the film is perhaps unusual for the Bond series in having a strong narrative theme: revenge and its personal consequences. FYEO was also the first James Bond film to be directed by John Glen. The film was released on both June 24 (in the United Kingdom) and June 26 (in the United States) of 1981 (two weeks after the release of blockbuster Raiders of the Lost Ark). Despite the film's mixed critical reception, the film was a monetary success, generating $195.3 million worldwide.